Why use 100% Cotton Fabrics? When you read instructions for making a quilt or making blocks for a swap, almost every single time the instructions say, "Use good quality 100% cotton fabrics." We have seen that written so many times that we just tend to gloss over it. Most of the places where we shop only carry 100% cotton fabrics, but other places have fabrics that are blends or are made totally of something other than cotton. This beautiful Grandmother's Flower Garden quilt has been on my bed for several years. I don't know the name of the maker, but she was the mother of one of our neighbors when I was growing up. My Mom went with our neighbor up to Michigan to visit the neighbor's Mother, and my Mom fell in love with this quilt....so the lady told Mom to take it home with her and enjoy it. She did that until she passed away in 1995, and now I have the quilt. I would guess that this quilt is at least 50 years old. 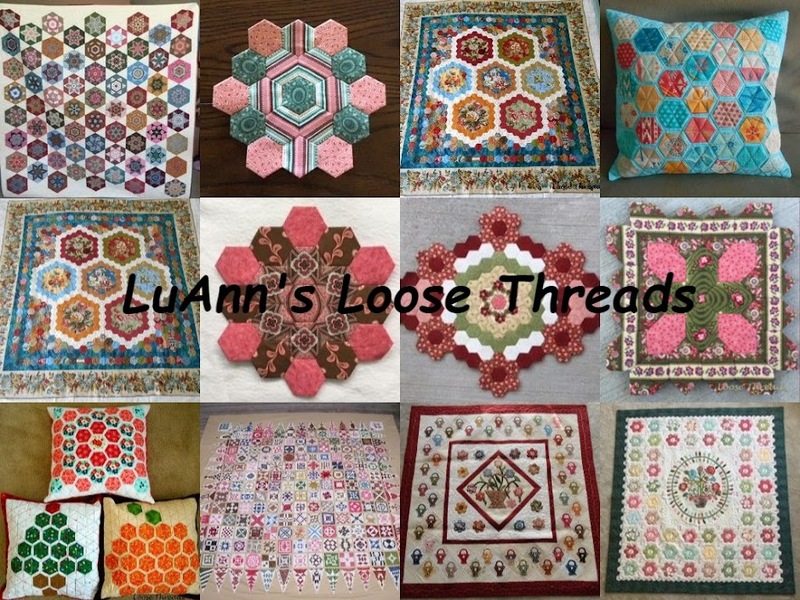 Think of the amount of time that it took to hand pieced all of these hexagons. It is also beautifully hand quilted. I don't know if you can see in the above photo, but take a look at the close up of the block below. The brown fabric in the first round of this block was made from something other than 100% cotton. I'm not sure what the fabric is....maybe polyester or a blend. You can see the beautiful hand quilting on this quilt. There are two other places where this same fabric was used on this quilt. There is a half block at the top and bottom of the quilt, too. I plan to try and applique' some other fabric over these worn places and hand quilt to make it look like the rest of the quilt. A bed sheet was used as the backing for the quilt which was fairly common around this time. The sheet is still in fine shape. For the most part, this quilt is still in fine shape, but you can see the reason why there is always that little sentence...Use 100% cotton fabrics...in quilt instructions. So no matter how much you may love a fabric, always be sure to check the fiber content on the fabric before you buy it and use it in your quilts. I hope you are doing a little stitching this weekend! This morning I have my Trick or Treat Baskets from the book When the Cold Wind Blows by Barb Adams and Alma Allen for Blackbird Designs up on my design wall. These are the baskets that will finish at 4 inches. These are smaller than the pattern in the book. Here are the small baskets and some that are a bit larger than those but still not as large as the pattern in the book. I down sized the pattern from the book so that my template would fit on a charm square with enough seam allowance to turn under for applique'. The larger baskets will finish at 5 inches. None of these have been trimmed yet. I was going to make a separate quilt with the smaller baskets that I have finished and the dozen or so that I have prepped and then make a larger quilt from the larger baskets. But I could use the smaller baskets as the center and then finish the quilt with the larger size. Here is what I use to do my applique'. I trace with the Sewline pencil and use the Sewline refillable glue stick. I applique' with straw needles in either a size 10 or 11 using Mettler Size 60 thread in a color to closely match the color of my basket fabric. Last week I found this 5 1/2" ruler at my local JoAnn fabrics. This ruler will make it so much easier to trim all of the baskets, and I had a coupon. I forgot to include one of my favorite tools in the picture. I always keep a few toothpicks in with my applique' supplies. If you have used your needle to turn under your fabric at corners or other places where you have clipped and the threads begins to fray, a moist toothpick will grab onto the fibers so that you can sweep the fabric under easily. Below is my basket template. I just hold the plastic template on my basket fabric and trace around it. Then I put a couple dabs of glue on the back so it stays in place on the background. When I get to a corner where I have clipped, I bring my needle up and then go straight back down at that point maybe even a couple of times to anchor that corner. I clip the little square in the basket center first and then begin to applique'. I anchor my stitches at each corner to help square up the center. Here is my finished basket. After seeing the two photos above, I fixed the upper right corner of the basket. After I got a good look at the enlarged photo of all of my baskets up on the design wall, I thought about just not posting today. I know my baskets aren't trimmed, but they sure look "wonky" to me. It could be because my template isn't symmetrical, or I have the handle taped onto the basket bottom crooked. Or maybe my template slipped when I traced it or some of my fabrics were directional or maybe I just plain don't applique' on the line. It could be "all of the above". As some of my friends would say, "Noone will see it from a galloping horse." I think that quilting should be something that you find fun and low stress. Whenever it becomes a chore then you should give it up and move on to something else. These little baskets are very portable, make great TV work in the evenings, and I'm enjoying them. Now I'm off to look for some graph paper so I can redraw my template, but these baskets will all go in the quilt just as is. Even some of my best Longaberger baskets have imperfections and are not perfectly square. I hope you are finding some time to stitch today!!!!! I haven't done a lot of machine sewing lately, so today I decided I'd make some half square triangles. I'm using Inklingo. In case you aren't familiar with Inklingo, it is a great quilting tool by Linda Franz. You download shape collections from her web site to your computer. Then you choose your fabrics, iron the right side of the fabric to a sheet of freezer paper, and run it through your printer to print the shapes directly onto the back of your fabric. First I ironed my light colored fabric with the right side down onto the shiny side of the freezer paper. If you look close you can see the lines that are printed on the fabric. From one strip I end up with 6 half square triangles. Or you can cut a piece of fabric 8 1/2" X 11 and sew an entire sheet of half square triangles from one fabric. I just cut my background fabrics printed with Inklingo into strips to give more variety to my triangles. I've had this book by Edyta Sitar for over a year and still want to make a couple of the quilts in it. All of the quilts in this book use 2 1/2" half square triangles and most are scrap quilts. Soooooooooo....I'm not really starting a new project - I'm taming my scraps. Good morning and welcome to my new followers! This week I've finished one hexagon flower. I've also finished a few Trick or Treat baskets from When the Cold Wind Blows by Barb Adams and Alma Allen. I've been a bit under the weather the past week, but I ventured outside yesterday when I heard the Blue Angels practicing for the Mount Comfort Air Show not far from here. We live just close enough that we can see them as they make their turn around to head back to the airport and hear the roar of the F-16 engines. While I was outside, I looked out back and noticed that my peony bushes were in bloom. I love the color of these. You can go over to Karen's blog and take a look at all of the hexagon flowers that were made this week. I hope you are all finding some time to stitch this weekend! I couldn't show you what was on my design wall yesterday because I'm working on a round robin. In the evenings I've been working on the applique' border on this quilt that you saw in an earlier blog post. When I posted it before, I got several comments and emails telling me that I really should finish the other 3 sides of the applique' border so that has been my focus in the evenings. This quilt is a UFO called Nine Patch and Hourglass and is from the Leisure Arts book Quick and Easy Scrap Quilts. I hope you are all finding some time to stitch, too! Thanks for stopping by for a visit. These are 4 of the winners in the Paducah AQS Show. There were so many beautiful quilts in this show that I wish that I could post them all here for you to see. The names of the winners and prizes are listed on the AQS site, but I wanted to share my photos of the quilts with you here. Outside of the quilt show there was this taxi. The name made me smile. Our last stop on the bus trip was at Hancocks of Paducah. It was after dinner, and we were given one hour 15 minutes to shop before heading home. There were about 80 quilters on our two buses, there was another bus in the parking lot, and the rest of the lot was filled with cars. We hit the ground running, and most people went inside and grabbed a cart. The scene inside reminded me of an old TV show from years ago where there were two shoppers who each were given a shopping cart in a grocery store, and the winner was the one who had the biggest dollar value in her cart. The site inside looked like a quilter's demolition derby with carts going every direction. I would have loved to take more photos inside Hancocks, but I used the time to shop instead. Here is my bag from Hancocks. I bought a layer cake of Origins by Basic Grey for Moda. Most everything else in my bag came from the flat folds in the back room. If you have never shopped at Hancocks, there is a back room with one yard cuts that are folded up and stacked on several tables. Each one yard cut is $3.98. The trick is to find a place at the table and begin sorting. Most people find something they like and want more of so they wave their piece of fabric in the air and say, "if anyone finds more of this one I'd like to have it." So the pieces of fabric begin flying. There was even some Kaffe on the table. I wanted the green floral in my bag for a backing and the stripe for a binding, and I had a lot of help finding enough. Here are the rest of my purchases from the vendors. This post has lots of photos, but there were so many beautiful quilts that it was hard to choose favorites. Here are a few of those that really caught my eye. I love the big circular applique designs. This Grandmother's Flower Garden was just striking. This is the Marsha Radtke applique' quilt that has been a favorite of mine. Beautiful Red and Green Revisited. The flowers in this quilt are made from yo-yos. I loved all the border work on the next two. The blocks in this one were pretty simple, but the placement of color made this quilt one that I wanted to study further. It looked just like you could walk up to this quilt and take the red beads right off of the table. Here are three of the miniatures. The photos were taken through glass so aren't too clear. If you go to the AQS site, you can see photos of all of the winning quilts. I hope you are all taking a few stitches today. Thanks for visiting. Day 2 of my trip to the AQS Show in Paducah started with our bus ride from Marion, IL, back into Paducah. Our first stop was at the part of the quilt show that was in a vacant Circuit City building and another store that had also been closed. I was told that when the decision was made to move part of the quilts and vendors to these buildings that the walls inside these buildings were painted, carpets cleaned and electrical wiring added in order to be able to put the proper lighting on all of the quilts and vendor booths. I think this was my favorite quilt at this first stop. The applique' was beautiful, but the ribbon it was awarded was for the machine quilting. Every time I see this little quilt, it makes me laugh. The title is Boys Night Out. These two Baltimore quilts were beautiful. Here's an Aunt Millie's Garden. The background is lavender with a thin irregular stripe. I liked this one a lot, too. Another pretty applique'. All of the alternate blocks in the nine patches had appliqued circles. Here are a few of the wall hangings that were part of the Pilgrim/Roy Challenge exhibit. I hope you are enjoying seeing some of the things that I saw at the Paducah Show. There were so many beautiful quilts it would be hard to pick just one favorite. Next post we go into what everyone affectionately called The Big Marshmallow.